Seen here while enjoying a cooling gelato (mix of mango, pear and passion fruit) with friends in the West Village after a successful day of Urban Scout Adventures. A curious urban mountain or boulder of some sort. 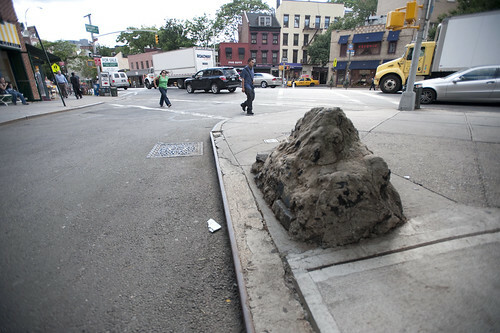 I think there’s a story behind this concrete lump, but I’m not 100% sure. It could be some sort of street furniture, or perhaps an accident that occurred while concrete was being poured and no one cleaned it up?